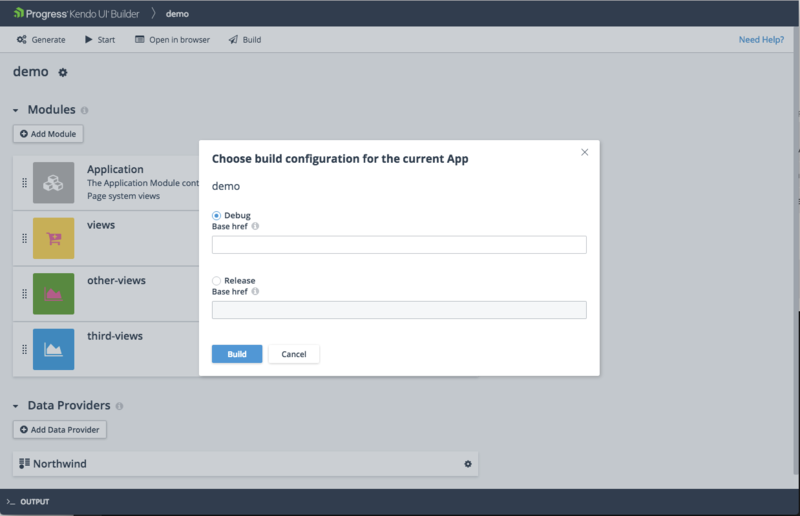 The Builder provides options to build your web application in debug or release (production) configuration by using the Build button. The button is available on both the App Design page and the toolbar of each view. When you click Build, the button generates the latest source code of the application and then, depending on the selected configuration, builds the deployment bundle in the build_output/debug or build_output/release local folders. To deploy your application, copy the contents of the deployment bundle to a web server. The debug version of the deployment bundle contains development-friendly code in a non-minimized format. If you host your application in a sub-folder of your web server, you have to set the Base href property to the name of that sub-folder. For example, if index.html is on the server at /my/app/index.html, set base href to /my/app/. If you copy the project to the root directory of the server, omit this step and disregard the Base href setting.